Our mother will tell everyone she meets to eat more almonds. They’re healthy, they cure all ills especially high cholesterol. She’ll tell you, “Yes my doctor told me my cholesterol was a little high. Do you know what I did? I took cinnamon in hot water. And ate almonds every day, lots of them.” If you’re family, she will even hand you a bag of almonds and command you to eat them, telling you they’re good for your heart. We like to think people leave her a bit healthier (and a bit fatter, but that’s another story). And they are really healthy – not only are they good for your heart and cholesterol, they are good sources of vitamin E and protein to keep your hair and skin looking lovely. We also like to dab some almond oil onto our dark circles at night and at the ends of our hair, which works a treat! So how do you work in both almonds into your diet (other than eating them whole)? You put them into your favourite foods. What are our favourite foods? 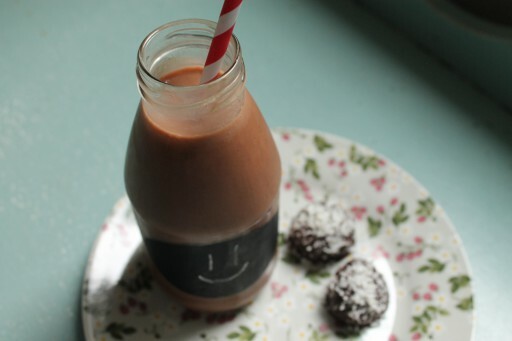 Chocolate truffles and chocolate milk. (You thought we were going to say salad. Ha!) 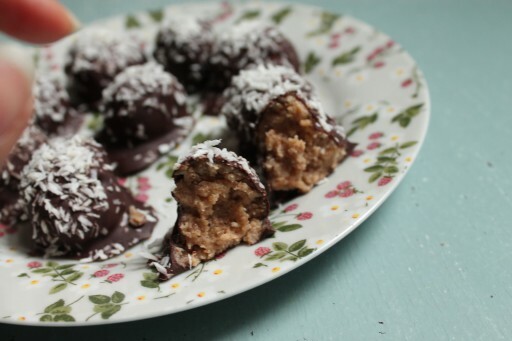 So we replaced the inside of the truffles with homemade almond butter and the milk with almond milk… ta-da! Don’t you feel healthier already? Of course, you also have to make sure you use minimal ingredients and absolutely no cream (sorry). We didn’t say life was fair. Pour the almonds into a food processor. Grind for about 20 minutes or so until you achieve a smooth butter. If the motor gets too hot, give it a rest for 5 minutes before starting again – you wouldn’t want it to explode! Scrape the butter into a mixing bowl and add the store-bought almond butter that you completely forgot about. Add the teaspoon of coconut and vanilla. Mix thoroughly and make 12 equally-sized balls. In a bain marie, melt the dark chocolate. Using two spoons, drop each almond butter ball into the dark chocolate so that it is covered thoroughly. 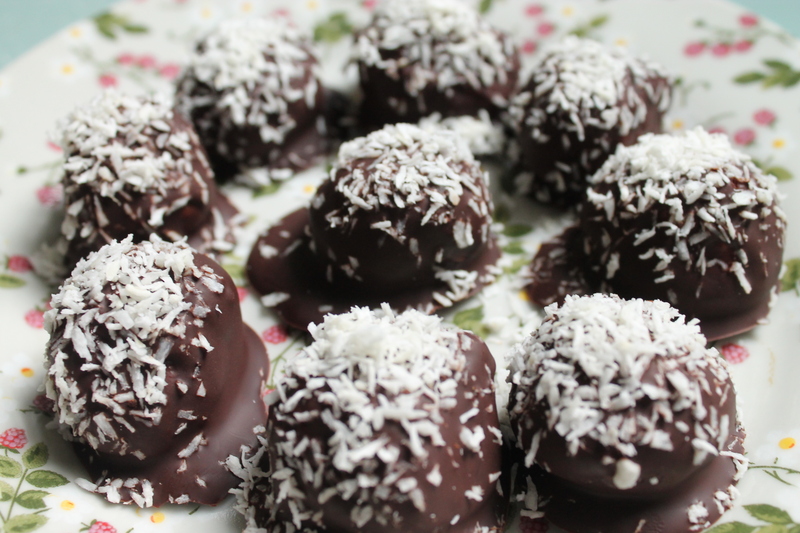 Place each coated truffle onto a lined baking sheet and sprinkle coconut on top of each truffle. Place the sheet into the fridge and leave for at least 4 hours until firm. Enjoy or store in the fridge for about a week. Add a little bit of the almond milk to the melted chocolate and mix to form a paste. Then add the rest of the almond milk to the chocolate paste, whisking constantly. Keep whisking until the chocolate has melted into the milk. Don’t let it boil! Add the honey and cinnamon and stir until it has dissolved. Pour into a glass and enjoy immediately. It’s also delicious cold! Store for about 3 days. Very funny! But make sure you don’t eat more than a handful of almonds. They can be fattening.